The Met Cloisters in New York is a museum in the style of a medieval European monastery, surrounded by beautiful gardens. It is part of the well-known Metropolitan Museum of Art on the Museum Mile in Manhattan. 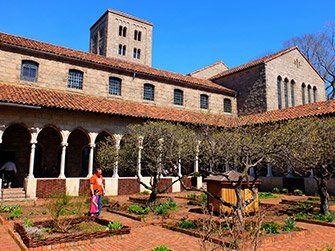 The building alone, in which The Met Cloisters is housed, is well worth a visit. Have you already visited the main attractions of New York or are you a big museum lover? Then you certainly must visit this museum, situated in the northernmost tip of Manhattan. The museum focuses on European medieval art and architecture. The collection comprises of around 5,000 artworks. 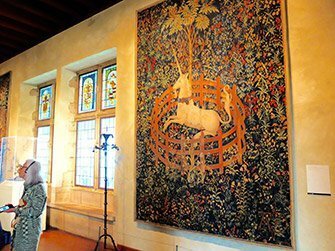 You can view sculptures, stained glass, tapestries and much more, mostly dating from the twelfth to fifteenth century. The collection belonged to John D. Rockefeller Jr, who also bought the land on which the museum was later built. The museum isn’t very big, even if you take your time to view everything, you’ll need around an hour and a half. Eric’s Tip: One of the highlights of this museum is the surrounding gardens, which are full of trees, like the park in which the museum is located. It’s a good idea to plan your visit when when the trees are green. The museum cafe will also be open then (April through October). The building that houses this division of The Met is very impressive. If you didn’t know better you’d think it had been there for centuries. 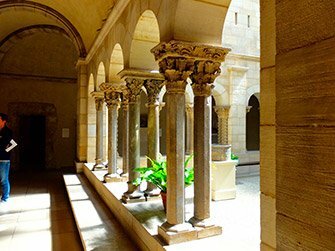 In fact, the cloister wasn’t built as such, but was composed of parts of several European monasteries. The building was constructed in the 1930s and was immediately converted into a museum. It’s surrounded by reconstructed medieval gardens. Eric’s Tip: The New York CityPASS and the New York Pass give you access to The Met Cloisters. It’s not possible to buy separate tickets for this museum as the entrance is included in the tickets to The Met. These tickets also give you access to another division of The Met, namely, The Met Breuer. 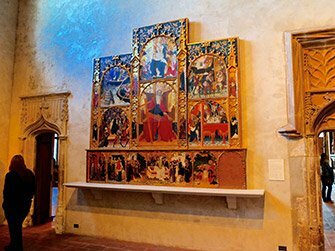 Because the travel time to The Met Cloisters is rather long, it’s difficult to visit all three museums (fully) in one day. 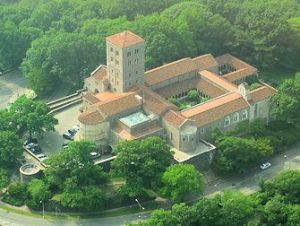 Getting there: The Met Cloisters is in Fort Tryon Park, around 30 minutes away by metro from Midtown Manhattan. The A train takes you directly from Times Square to the museum.